It’s that time again! Time for turkey, cranberries, festivities and coming together to be thankful for so many things in life. What better way to celebrate Thanksgiving than with the classic Thanksgiving turkey. Below is everything you need to prepare the perfect bird. Total Time: three hours and ten minutes (two hours baking, one more hour baking after putting the rub on, and 20 minutes out of the oven to cool). 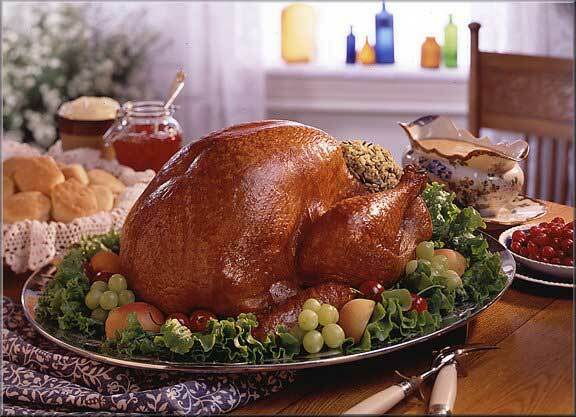 Preheat oven 325 degrees F. Place turkey on a rack in shallow roasting pan, breast side up. Tuck wings under the turkey and gently tie drumsticks together. Bake for 2 hours. In a small bowl, combine remaining ingredients above; brush over turkey. Bake 1 more hour or until the temperature in a thigh reads 180 degrees F. Baste occasionally with the pan drippings and cover loosely with foil. Remove from oven; set aside to rest for 20 minutes before carving. Slice and serve warm. Enjoy!